Just before we got started Wednesday afternoon (Jan 26th) at the Summit of the Future, I took a shot of those coming into the session. We had a great time exploring the future, with excellent presentations from Paul Kafno, Helen Shaw, Wim van de Donk and Gerd Leonard. 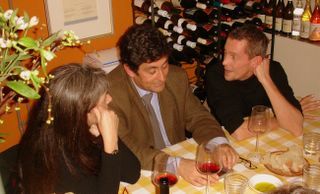 Restaurant Marius is a great Italian that deserves to be discovered by more people. It is at Barentszstraat 243 in Amsterdam 1013 NM. Eat there with friends and was amazed at the variety of the menu...and healthy too. I met Glen at the Summit for the Future in Amsterdam. He's a great personality and someone who knows how to formulate the right questions - and has suggestions for looking for the right answers. Check out his stuff here. I particularly like his Portal to the Future. Gerd Leonard - he gets it! Gerd is a musician. 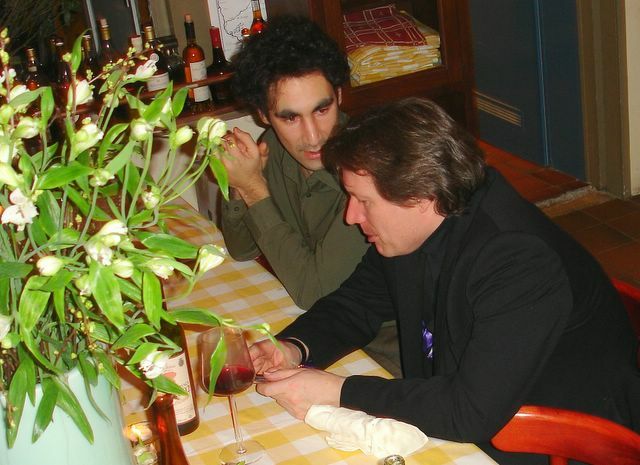 He is also a futurist and just a really nice guy. I think he is a leading light when it comes to thinking about the future of the music industry. He also believes in the idea of sharing ideas for free - and making the money when people want something specially tailored to their needs. 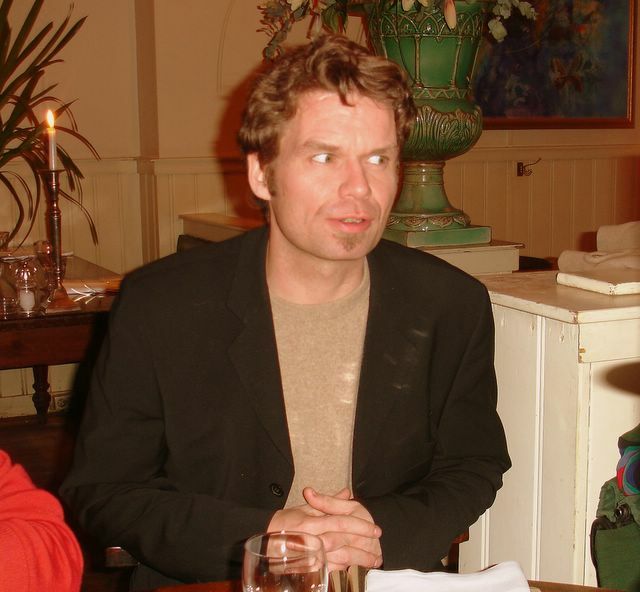 Check out his website or read his paper given at the Club of Amsterdam Summit of the Future. Some interesting stats can be found here too. Known to the American business press as the "world's friendliest guru" Tom Lambert is an international author, broadcaster, consultant, trainer, conference speaker, businessman and business journalist. 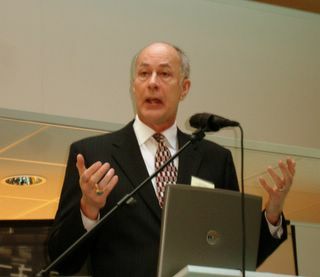 In Europe, America and Southern Africa his books and seminars have led him to be known to the quality business press as "the consultant's consultant". .
Tom is CEO of the international Centre for Consulting Excellence (CfCE) a professional body launched by leading academics and businesspeople in the UK, USA and Australia with links to the ASEAN Region, Middle East and the EU. The CfCE is an organisation that works with business and academia to ensure the highest standards of consulting and interim management - and fee income that makes those standards essential - are sustained in a highly volatile and competitive business environment. I am coordinating a group of volunteers to organise an overview of how various organisations around the world have reacted to help broadcasters affected by the December 26th Earthquake and Tsunami. We all share the belief that by sharing this information on a new portal, that broadcasters will be stimulated to coordinate their efforts. 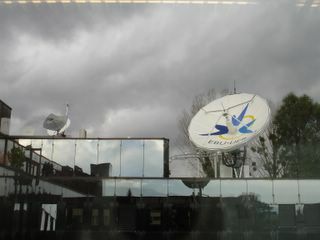 In Geneva when all the power went off at the European Broadcasting Union. Suddenly Powerpoint doesn't look so good! After the tsunami hit Sri Lanka on 26 December, Victor Goonetilleke, head of the island's amateur radio society, delivered a short-wave radio set and two 12-volt car batteries to the prime minister's emergency headquarters in Colombo. At the same time, three of his friends drove through the devastation to Hambantota, on the hard-hit south-east coast, where they set up another battery-powered short-wave radio. For two days, while the military struggled to restore electricity supplies and phone lines, the prime minister was able to use the short-wave link to talk to staff on the ground. 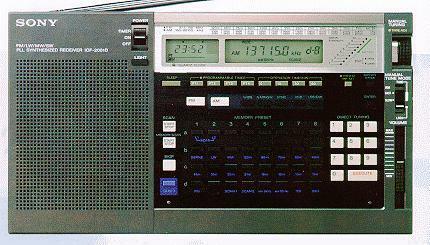 Short-wave signals from Sri Lanka, the Andaman Islands and mainland India also helped to spread news of the disaster around the world. The same happened after the 9/11 attacks and last year's hurricanes in the Caribbean. When phones and mains electricity are down, making the internet unusable, short-wave radio enthusiasts are able to maintain emergency communications. But not, perhaps, for much longer. Plans to deliver broadband internet signals to homes and businesses down mains electricity cables, rather than telephone lines, could cause interference that will drown out the faint signals from distant short-wave transmitters. Power companies in the US and Europe are pressing ahead with the technology, with the aim of setting up in competition to existing phone-based services. The downside is that the packets of internet data pulsing down unshielded mains cables makes the cables behave like aerials that send short-wave interference beaming out over a wide area. Unless interference of this kind is tightly controlled, it could spell the end for emergency short-wave communications. 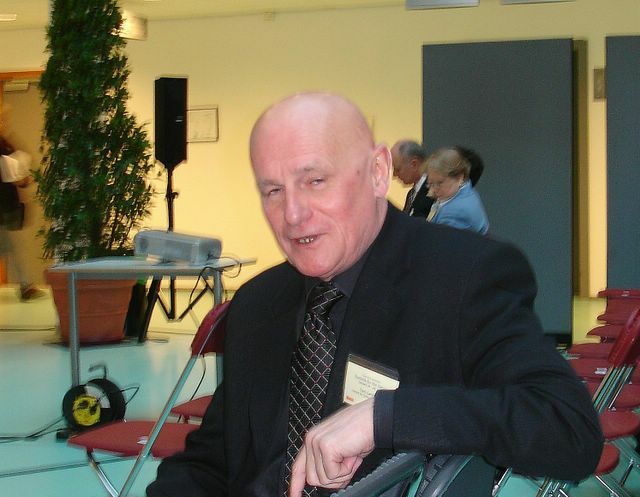 "A few extra decibels of interference from future networks and I would not have been able to hear the news from amateurs in Sri Lanka, India and the Andaman Islands," says Hilary Claytonsmith of the International Amateur Radio Union's UKbranch. The threat began when the US government gave the go-ahead to broadband over power line (BPL) technology in October. And the European Commission (EC) is close to approving its own version, called power-line communications (PLC). The names are different but the technology is the same: broadband data is sent into people's homes as a high-frequency signal piggybacked on the 50 or 60-hertz mains supply. Some technical fixes may be in the works though. The BBC, for instance, is developing a PLC modem that makes use of the fact that the short-wave frequencies for broadcast radio change throughout the day, as ionospheric conditions dictate. The BBC modem detects which frequency bands are in use at any one time - and filters them out. Such technology is not part of any PLC or BPL system currently in trials, however. NASA - Cassini-Huygens: Close Encounter with Saturn Brilliant Photos from Titan. Interesting that no-one outside Holland seems to be able to say "How gens", the name of the Dutch scientist Huygens. It is not Hoigens or Hew Jeans. Coming soon to selected theatres....Don Cheadle stars in "Hotel Rwanda", the true-life story of Paul Rusesabagina, a hotel manager who housed over a thousand Tutsi refugees during their struggle against the Hutu militia in Rwanda. One of the aims of the movie is to establish the degree to which the extremist Hutu radio station RTLM incited the genocide by spewing nonstop hate and venom against the Tutsis. The film, nominated for three Golden Globes, is rated PG-13 in the US. The Official Website for Hotel Rwanda contains a direct link to the Rwanda page in the Radio Netherlands dossier I helped to create called Counteracting Hate Radio. Click on 'facts' and then 'Rwandan Radio Announcements'. This explains why the page has suddenly been getting an average of several hundred page views each day. 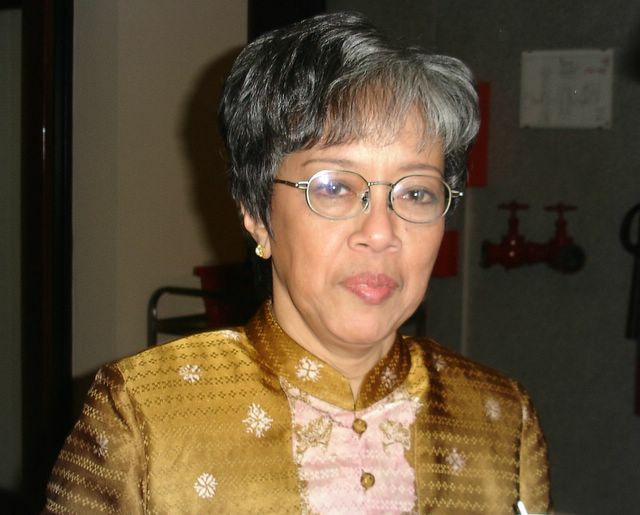 Indra Titus - Head of Radio Netherlands Indonesian Dept retires today. Busy with several projects in the aftermath of the Tsunami disaster. Do the Shuffle? 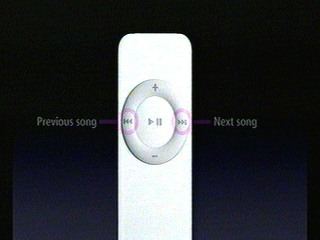 Apple just announced they are shipping the i-pod Shuffle...about the size of a memory stick. The controls are simply play/pause, previous/next, volume up/down because there is no display. You connect it to your laptop with a USB 2 connector. US$ 99 for 512 MB, US$149 for 1 GB, so size comes at a big price. My playlist on the regular size Ipod is too big to Shuffle. Great news for some, not for me though. Apparently, investors appeared also unimpressed with Jobs' announcements. Apple's shares fell $2.71 to $66.25 during Tuesday's trading on the Nasdaq Stock Market. In mid December 2004, Ofcom published the first stage of its proposals for the development of a new framework for commercial radio in the UK. The proposals, which draw on dialogue with the radio industry, audience research and financial analysis of the industry, are intended to support moves towards greater choice for listeners and what is termed "less intrusive" regulation of the commercial radio sector. The review is structured into two main phases. Phase 1, published on December 15th, addresses the immediate priorities required by statute whilst also putting forward for public consultation a number of potential options for the future. 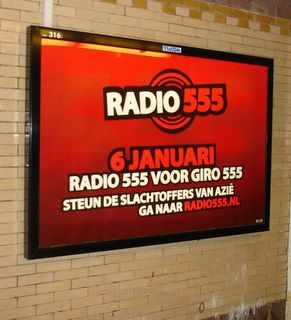 Phase 2, which will be published in the spring of 2005, will aim to reach conclusions on a broad number of issues of interest to the radio industry as a whole. * Allocating three more blocks of spectrum in VHF Band III to complete the coverage of DAB local digital radio throughout the UK . * Proposing to raise the current 20% limit on the use of DAB digital radio multiplexes for non-programme related data such as multimedia downloads. This would require approval from the Secretary of State for Culture, Media and Sport. * Replacing specific requirements about audio bit-rates for DAB digital radio services with a system of co-regulation to define audio quality standards which meet audience expectation. Ofcom also seeks the views of industry and the public on the likely demand for additional nationally-allocated spectrum for DAB , whilst recognising Digital One’s investment in digital radio as the current commercial national radio multiplex licensee. Ofcom is seeking views on the allocation of 10 medium wave frequencies, each of which could be re-used in more than one area, for new community radio or local/regional commercial services. Ofcom proposes to adopt a less intrusive approach to the regulation of local analogue commercial radio. This would involve a shift away from a focus on the mechanisms by which programming is produced (known as input regulation) and towards a greater focus on the experience of the listener – or output regulation. Commercial radio stations operate according to an agreed specific format – a formal regulatory document summarising the station’s character of service, key programme promises and target audience. Ofcom proposes to require commercial stations to demonstrate adherence to their specific formats. It also proposes to use its new localness guidance, where appropriate, to regulate the local aspects of a station’s programming. * Studio Location. Ofcom proposes to relax the requirement for a station’s studios to be located within its Measured Coverage Area (MCA), allowing them instead to be based within the station's wider licensed area. * Automation: Many stations now use elements of computer-controlled programming, such as music playout systems, voice tracks, drop-ins and commercials, which are played in accordance with a pre-defined schedule and which are not under the direct control of an on-air presenter. Ofcom is seeking views on the removal of all specific limits on the use of automation. * Networking. This is defined as the transmission of the same programme at the same time across a number of interlinked but separate stations. The review will clarify that Ofcom will allow the networking of programming outside each station's locally-made programming requirements as specified in its respective Format. * Local News Delivery: Ofcom wants to consider the case for allowing a group of local stations to operate a central news hub, distributing news material from the centre that is of interest to the separate audiences of each station. However, Ofcom also proposes that each station should maintain a local journalistic presence to ensure that the use of news hubs would not be to detrimental to the provision of a high quality local radio news service. Ofcom proposes to introduce a new system of self-reporting which will require all stations to maintain a file stating the extent to which they have complied with their respective format and localness requirements. The file should be made available to the public on both the station’s website and in hard copy on request. Ofcom will carry out spot checks on compliance and will also investigate complaints from listeners and competitors. Ofcom Chief Executive Stephen Carter said: "Radio is a dynamic medium at an interesting point of development." He added: "These proposals seek responses to the prospect of more digital spectrum and a new approach to content regulation." 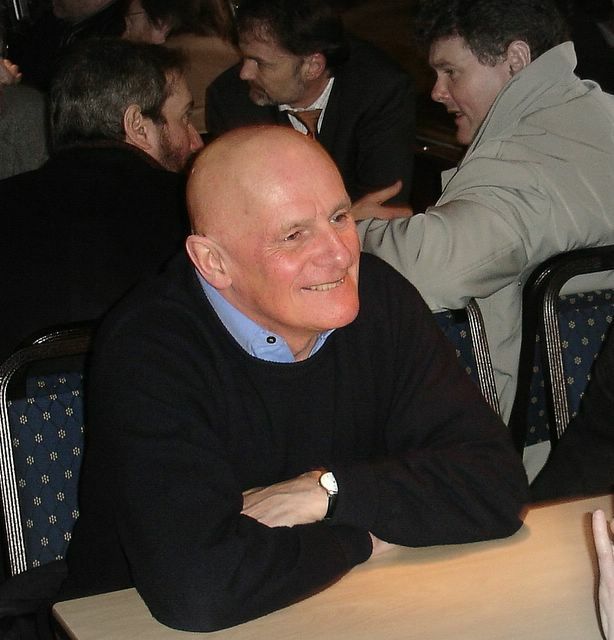 The closing date for comments on ‘Radio – Preparing for the future’ is 7 March 2005 . Victims of disasters will now be able to benefit from faster and more effective rescue operations, thanks to the Tampere Convention on the Provision of Telecommunication Resources for Disaster Mitigation and Relief Operations that finally comes into force tomorrow, Saturday, 8 January 2005, following ratification by 30 countries. Until now, the trans-border use of telecommunication equipment by humanitarian organizations was often impeded by regulatory barriers that make it extremely difficult to import and rapidly deploy telecommunications equipment for emergencies. Disasters are considered to kill one million people each decade and leave millions more homeless. When disaster strikes, communications links are often disrupted; yet for disaster relief workers who arrive on the scene these links are essential. Questions that require information gathering for immediate response include: how many people have been injured or have died, where the injured are located, where they should be dispatched and the extent of the medical help needed. As well, workers rely heavily on telecommunications to coordinate the complicated logistics of rescue and relief operations. In the absence of an agreed multilateral framework that temporarily waives formalities, delays have meant the loss of lives. With this Convention, relief workers can make full use of today’s telecommunication tools which are essential for the coordination of rescue operations." The Tampere Convention calls on States to facilitate the provision of prompt telecommunication assistance to mitigate the impact of a disaster, and covers both the installation and operation of reliable, flexible telecommunication services. Regulatory barriers that impede the use of telecommunication resources for disasters are waived. These barriers include the licensing requirements to use allocated frequencies, restrictions on the import of telecommunication equipment as well as limitations on the movement of humanitarian teams. The Convention also safeguards the privileges, immunities and facilities granted to persons providing disaster assistance by granting them immunity from arrest and detention and exempting them from taxation and duties. As the first treaty of its kind, the Convention also defines the non-governmental organizations and non-State entities whose personnel would be granted these privileges and immunities when engaged in supporting the work of UN humanitarian and rescue organizations such as the United Nations High Commission for Refugees (UNHCR), OCHA and the International Federation of Red Cross and Red Crescent societies (IFRC). The Convention defines the overall framework for the cooperation among States parties and all other partners in international humanitarian assistance. It describes the procedures for request and provision of telecommunication assistance, recognizing the right of a State party to direct, control and coordinate assistance provided under the Convention within its territory. It defines specific elements and aspects of the provision of telecommunication assistance, such as termination of assistance and settlement of disputes. It requires States to make an inventory of the resources — both human and material — available for disaster mitigation and relief, and to develop a telecommunication action plan that identifies the steps necessary to deploy those resources. The Convention requires a requesting State party to the Convention to put in writing, prior to the arrival of telecommunication assistance in a disaster zone, the fees it expects to receive or have reimbursed. To avoid excessive charges, the fees are based on an agreed model of payment and reimbursement, as well as on other factors such as the nature of the disaster, natural hazard and the particular needs of developing countries. In fulfilling the objectives of the Convention, the Operational Coordinator will seek the cooperation of other appropriate United Nations agencies, particularly the International Telecommunication Union. The seventeen-article, legally binding international treaty, was unanimously adopted on 18 June 1998 by the delegates of the 75 countries that attended the Intergovernmental Conference on Emergency Telecommunications (ICET-98), hosted by Finland in Tampere, about 200 km north of Helsinki. The Treaty was then open for accession, requiring 30 ratifications to come into effect. Clusty - Better than Google? Writing and researching for a living, I make extensive use of search engines and have a low tolerance to rubbish. So I was intrigued when Colby Stuart passed on this clipping from Business Week Magazine. "Since its launch three months ago, Clusty has generated buzz for its clean design and clever approach. Using artificial intelligence, Clusty groups search results into different categories. The idea is to help people quickly navigate through the flood of results a general search engine lists without any organizing principle beyond popularity." Been playing with Clusty for a few days, and I like the way it puts links into logical clusters. I found it a useful alternative to Google, but not a replacement. There were links that Google found that Clusty didn't - and vice versa. But definitely better than AltaVista and Lycos. Chris Willis and Shayne Bowman have created an excellent spot for discussion on the future of media in an age of blogging. Personally, I believe that all the technology in the world won't change the fact that most people are not story-tellers. If you can't grab someone's attention, your blog will have more people writing it than reading it. Click the headline for details. Commercial Radio Australia is spearheading a mission to restore broadcast operations in tsunami-hit countries, contributing some 50,000 AM/FM radio sets to affected areas. This initiative, which is being coordinated by the Asian Broadcasting Union, calls for the donation of radio sets and broadcasting equipment to survivors and broadcasters affected by the disaster, which has claimed almost 150,000 lives and left millions homeless. Joan Warner, CRA’s chief executive officer, said the first batch of 5,000 radio sets would be shipped to Indonesia in a week’s time, with the rest to be despatched to affected areas over the next four to five weeks. “We also have up to six transmitters that we can donate,” she said. Ms Warner also said CRA would send at least 12 engineers to rebuild broadcasting facilities in disaster zones. The engineers will be sent in groups of four for a few weeks at a time. CRA is an industry body representing Australia’s commercial radio broadcasters. France’s Eutelsat SA, an ABU affiliate member, will allow free usage of its fixed satellite services (FSS) in affected areas. A representative, Jan Grondrup-Vivanco, said this would enable Internet access and Voice over Internet Protocol telephony be set up in these places. Meanwhile, Singapore’s MediaCorp has promised to look into the needs of Radio Television Maldives (RTVM) which lost much of its equipment when the tsunami struck. Offers of assistance to provide battery-operated radio sets and restore broadcast operations in countries hit by the December 26 earthquake and tsunami, in response to an appeal by the ABU, are coming from as far away as North America. The owner of a network of radio stations in Canada's Yukon Territory is pledging broadcast equipment and expertise for affected broadcasters. A representative of Burr and Burton Academy, a secondary school in Vermont, USA, has said its staff will begin collecting AM/FM radio sets for survivors of the disaster. Meanwhile, a radio engineer from California, USA, said he is willing to travel to affected areas at his own expense in order to help build and maintain radio stations there. An example of how public and commercial networks in the Netherlands can raise money and work together. This event was connected to the Tsunami disaster and raised 5 million Euro. Radio News from Las Vegas: At the International Consumer Electronics Show, 21 of the USA top radio broadcast groups and iBiquity Digital Corporation announced, what they claim, is an historic agreement to accelerate broadcast conversion of 2,000 AM and FM stations to digital HD Radio technology. Combined with the current 500 stations licensed, 2,500 stations have embarked on an HD Radio future, covering all of the nation's top 100 markets and beyond. The agreement includes station commitments from the following broadcast groups: ABC Radio (NYSE:DIS), Beasley Broadcast Group, Inc. (NASDAQ: BBGI), Bonneville International Corp., Clear Channel Communications, Inc. (NYSE:CCU), Cox Radio, Inc. (NYSE: CXR), Cumulus Media, Inc. (NASD: CMLS), Emmis Communications Corp. (NASD: EMMS), Entercom Communications Corp. (NYSE: ETM), Entravision Communications Corporation, (NYSE: EVC), Greater Media, Inc., Infinity Broadcasting, a division of Viacom Inc. (NYSE: VIA, VIA.B),. Jefferson-Pilot Communications Co., Journal Broadcast Group, Liberman Broadcasting, Inc. , NextMedia Group, Inc., Radio One, Inc. (NASD: ROIAK and ROIA), Regent Communications, Inc. (NASD: RGCI), Saga Communications, Inc. (NYSE: SGA), Sandusky Radio, Susquehanna Radio Corp., and Univision Radio, Inc. Separately, the Corporation for Public Broadcasting (CPB) announced recently a matching grant program for an additional 159 Public Radio stations to speed up HD Radio conversions. With matching funds of $21M to date, this brings the total Public Broadcast station commitment to 309. Another round of matching CPB funds is expected in 2005. XM Radio - XM Emergency Alert 24/7: "XM Emergency Alert - XM 247 is dedicated to providing critical, updated information before, during and after natural disasters, weather emergencies and other hazardous incidents to listeners across the country. Utilizing XM's nationwide broadcast system, XM Emergency Alert delivers key survival information such as evacuation routes, shelter locations, critical health and medical information, and updated weather emergency information for impacted areas. XM Emergency Alert provides data drawn from a variety of sources, including the Federal Emergency Management Agency (FEMA), the U.S. Department of Health and Human Services, the National Weather Service, police and fire departments, and local eyewitness reports. XM Emergency Alert is produced by a dedicated staff for instant, around-the-clock information during serious local emergencies. " Lawrence Lessig, author of "The Future of Ideas" held a lecture about creativity and copyright and digital rights management at the Hans Christian Andersen Academy at the University of Southern Denmark. 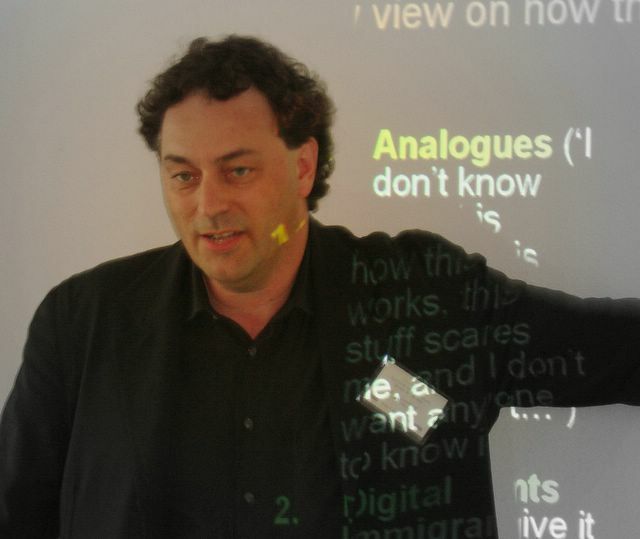 A video of the lecture is now online at: http://media.sdu.dk/hca2004/hca1.wmv. The Language Database is an excellent resource with over 1340 different languages and dialects listed. Fits in with a project I am doing at the moment. The Sony ICF-2001D / ICF-2010 is 20 years old in 2005, probably the best analogue portable world-band receiver ever made. You can still find it in some shops, though it was officially discontinued in the US in 2003. I'm just copying the first review I made of the set ...on Media Network 17th January 1985. Now here is a clever idea. Neil R. Bauman, describes himself as Captain & CEO of Geek Cruises, based in Palo Alto, CA. They arange interesting speakers from the IT world and put them on cruise ships, usually in the Caribbean, but also in Europe occasionally. If you haven't seen the 2002 Doc Searls' review of Linux Lunacy I'd suggest that you to read it as it gives a very accurate summary of the Geek Cruise experience. They claim that the small, interactive sessions with top-of-the-line speakers comes at a cost lower than a traditional conference. Since I tend to avoid the commercial conferences (in places like London) the comparison is a bit unfair, but its a much better way of spending cash than buying some Forrester or Gartner report. In an unprecedented and spontaneous show of unity, Chicago broadcasters are joining forces to aid the relief effort for victims of the catastrophic tsunami. Starting at 6 a.m. Wednesday and running throughout the day, radio and television stations will air public service announcements urging listeners and viewers to donate money to the American Red Cross/Chicago by calling a designated 800 number. Many also will air news stories and special programming related to the fund-raiser and provide online links from their Web sites. The idea of a daylong cooperative media event began with Steve Robinson, senior vice president of WFMT-FM (98.7 MHz). "Within hours of placing the calls, virtually every Chicago station called back to say: 'Count us in,' " Robinson said. "The response has been truly overwhelming. As people will see on Wednesday, our collective power to perform a community service is going to be enormous." As of midweek, participating TV stations include WLS-Channel 7, WGN-Channel 9 and WTTW-Channel 11. Others are expected to join. Radio stations onboard so far include WFMT, WGN-AM (720), WGCI-FM (107.5), WVAZ-FM (102.7), WNUA-FM (95.5), WLIT-FM (93.9), WKSC-FM (103.5), WGRB-AM (1390), WRLL-AM (1690), WTMX-FM (101.9), WILV-FM (100.3), WDRV-FM (97.1), WUSN-FM (99.5), WXRT-FM (93.1), WBBM-FM (96.3), WKQX-FM (101.1), WLUP-FM (97.9), WLS-AM (890), WZZN-FM (94.7) and WMVP-AM (1000). I haven't seen any news about what happened to Diego Garcia, bearing in mind this is a highly secret US base on British territory. According to the US military (see link in title) US Navy personnel on board Naval Support Facility Diego Garcia in the Indian Ocean are safe following the Dec 26th earthquake and subsequent tsunami that had devastating effects on Southeast Asia. Facilities and operations were not affected, at least according to official sources. Favorable ocean topography apprarently minimized the tsunami's impact on the atoll. Diego Garcia is part of the Chagos Archipelago, situated on the southernmost part of the Chagos-Laccadive Ridge. To the east lies the Chagos Trench, a 400 mile long, underwater canyon that ranges in depth from less than 1,00 meters below the surface to depths that plunge to over 5,000 meters. It is one of the deepest regions of the Indian Ocean. Diego Garcia is located to the west of Chagos Trench, which runs north and south. The depth of the Chagos Trench and grade to the shores does not allow for tsunamis to build before passing the atoll. The result of the earthquake was seen as a tidal surge estimated at six feet. GCHQ Challenge: " Perhaps following on from Google's methods of recruiting, the UK's Intelligence service is running a code-breaking competition. There are three parts to the solution. What is the connection between the men in the first list and the women in the second list? Which man pairs with which woman? And what is the hidden quotation? Just to make things a little more interesting, GCHQ will be offering copies of 'Big Bang' the latest book by Simon Singh, the well known mathematician and code expert, to six successful solvers whose names will be drawn from a hat. Answers should be emailed to pressoffice@gchq.gsi.gov.uk and must be received by Thursday 27 January 2005. The Columbia University lab where Edwin H. Armstrong developed FM radio technology in the 1930's has finally been given National Historic Landmark status. Armstrong's technology, which gave radio a better fidelity signal than the AM (mediumwave) band, had its public debut in the US as far back as 1939, though FM wouldn't become widely popular for another half century. An electronics genius, Armstrong conducted much of his radio research for military purposes - specifically, to enhance U.S. military communications in World Wars I and II. He had a frustrating time, however, with trying to get FM off the ground. He fought for much of his life to keep the rights to his invention and finally committed suicide in 1954 when it seemed he had lost them. His wife kept battling and eventually prevailed in court. Do click on the link in the title and explore the website dedicated to Armstrong...amazing and once again perfect proof that you don't have to worry about someone pinching original ideas...you have to ram it down people's throats to get it accepted. Critical Distance Wishes You a Happy New Year 2005. 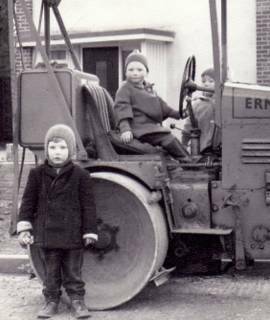 Digging in a digital archive, I discovered one of the world's earliest photos of Jonathan Marks (standing) doing some illegal project in Bengeo, Hertfordshire. May your electronic highways be paved with success in the coming 365 days.